The new 2014 BMW will be the first car that can drive for you in traffic. Here is what you should expect to pay. Look on the bright side you can fire the chauffer. BMW has announced pricing for the first vehicle that you can buy which will drive itself in traffic. The all-new BMW X5 is capable of keeping up with traffic, braking, and steering for you if you are too busy, or just prefer not to drive during the slog to work in traffic. Previously, the super-affluent had a device that did this which they called a butler or chauffer. Now it is an option on the new X5. Before we get to the pricing it is necessary to provide our readers with the secret decoder ring translation for BMW’s new X5 models. Gonne and forgotten are the logical model letter and number followed by the engine displacement and either an X or i to distinguish the number of driven wheels. These prices are up from the base 2013 X5 which cost $47,500. Across the board the prices seem to be about 7-10% higher than last year. The details will matter, and for 2014 navigation is now standard on all X5 vehicles. BMW has not listed option package pricing yet, but figure $10,000 more for a fully equipped X5 of whatever drivetrain is selected and you won’t be disappointed. The new “sDrive” means that these sport utes can now be operated in rear wheel drive. That is refreshing since AWD is a gas guzzling option, particularly for those who don’t need it. BMW’s diesel option will also be a fuel saver (though not necessarily more fuel economical compared to gasoline). However, buyers won’t be allowed to combine the fuel savings of 2WD and diesel, at least not this model year. 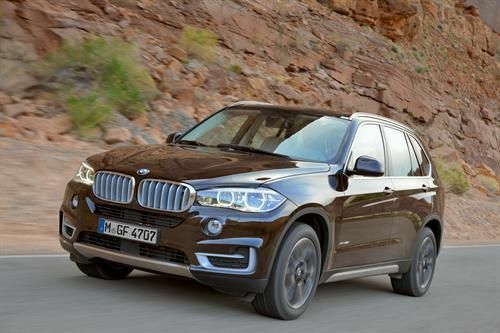 The new 2014 BMW X5 goes on sale late fall of this year. The self-driving package called Traffic Jam Assistant is not expected to be available until the very end of the year. It might be worth waiting, because all of your friends are going to ask if you got that, and how will you feel if you just paid about $70,000 for a high tech vehicle and didn’t get the coolest gadget?